Gracie and Tyson are a beautiful testament how the gospel of Jesus Christ can bless lives and bring two people together in love. 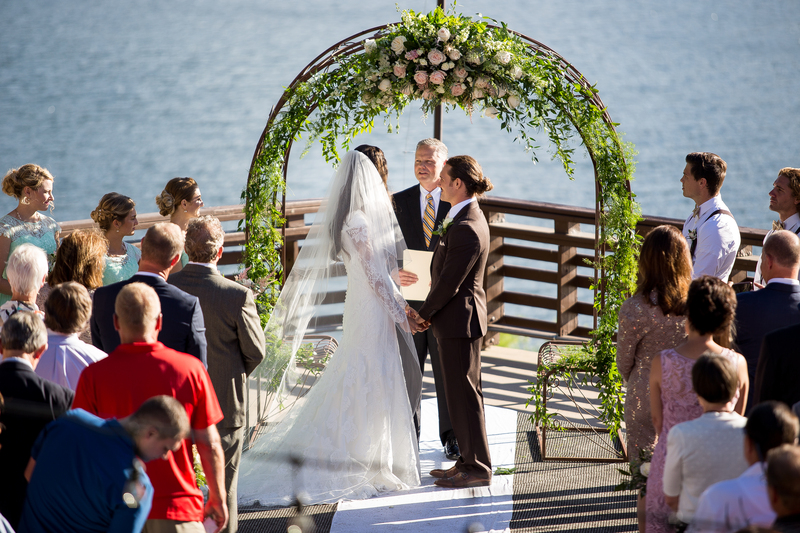 Their love story is one of conversion, faith, and two stunning ceremonies full of joy. 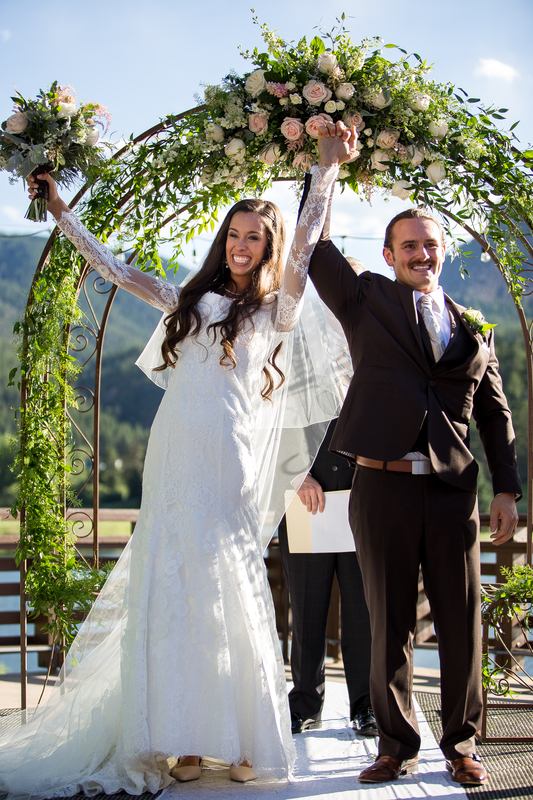 Grace and Tyson were married in a beautiful Colorado ceremony on July 8, 2016. They were sealed in the Logan Utah Temple on November 23, 2017. On the flip side, I was at school for 16 hours a day studying with a group of guys in my class, who I later found out were ALL LDS 😂. My boyfriend would tell me about his conversations with our neighbor and I would take my questions to my study group the next day. I became very good friends with one of the boys, whose name was Tyson. He would answer my questions and we would have wonderfully profound conversations. He invited me to attend a talk he giving at his local church… I knew I had to go because I felt so bad for him; he was new to AZ, he didn’t have many friends or any family that could go support him. LONG story short, the more questions I asked, the more familiar everything sounded and I realized that I had been missing something I didn’t even know I was missing! As I learned about the gospel I could feel a pull of how I was living and how I COULD be living. I talked to my boyfriend about it all. He was not feeling what I was feeling and ultimately made me choose between him and pursuing the gospel. During the October 2015 General Conference (which Tyson invited me to watch with him), Elder Randall K. Bennett gave a talk that spoke to my heart and helped me decide to “Take the next step”, which was the get baptized. My boyfriend and I went our separate ways and I entered the waters of baptism with none other than Tyson by my side. Although we lived close to one another in order to attend school, I was about a block and a half outside of Tyson’s ward boundaries. We both decided that it would be best for me to attend my own ward, which I did from that point on. Not much changed school wise; Tyson and I still spent about 16 hours a day together studying and would part only to sleep for a couple hours before starting it all over again. We would go to our respective wards and meet up after to discuss what we learned. Our medical school is unique in that we spend 1 year in Arizona and then we split up in groups of 10 students to move to a new community health campus somewhere across the United States, from Seattle to South Carolina, from Hawaii to Ohio. I was set up to go to Tuscon and Tyson was arranged to go to Cincinnati, OH. The spark between us grew as we spent so much time together, but we weren’t sure if we could begin a relationship and then move 30 hours away from each other. We prayed and through only the grace of God, I was able to find someone in the Ohio group who wanted to stay close to his wife’s family in AZ. There were NO SPOTS left and the administration was NOT ALLOWING anyone to switch anymore! Tyson and I began to discuss what our lives could be like together, but we had only been dating for a little over a month. We had to pick up and move everything in a few short months in order to go to Ohio and after many separate trips to the temple, many nights praying we both realized that we wanted to spend eternity together. However, I had not been a member of the church for a year yet (which you have to be before you can receive your temple endowment and sealing ordinances). I will also mention that I am an adopted only child of parents who live in Colorado. When they heard that I was joining the church (long before the prospects of Tyson) they were DEVASTATED because they knew they could not attend my wedding. However, Tyson and I wanted to be married prior to moving to Ohio and we decided to have a civil wedding ceremony first that my parents and family could also attend. Tyson proposed to me when we went on a trip to see his family and he did it in front of the Logan Temple 😍. I know that Tyson has always had his heart and mind set on being married in the temple (as everyone should), but with much praying and counsel from my in-laws, church leaders, etc. we knew that this was the best move for us as a family. We were married on July 8, 2016, in Larkspur, CO. We moved out to Ohio to begin our second year of medical school. We took temple prep classes and were sealed in the Logan Temple on November 23, 2017. CRAZY! For the civil wedding, I was planning it while in medical school. My mom was a ginormous help because she was in Colorado and she was elated that she was going to be able to attend my wedding. She was the workhorse and mastermind behind our beautiful CO wedding. Sage/mint and gold, the theme was vintage (we had nameplates for people at dinner with old keys attached to them). My wedding style is very traditional and classic. I love Dean Martin, Frank Sinatra, and old romantic styles. Not a single thing. Everything worked out PERFECTLY for both our Colorado wedding, our Idaho (where Tyson is from) wedding reception, and our Sealing. My dress was perfect – I found it at a Dressy Occasion in AZ and loved and bought the first one I tried on. My bridesmaid’s dresses were gorgeous and modest – found them online at a place in China 😬. The color was slightly more mint than I expected but for a summer wedding it turned out perfectly. All the flowers and decorations at all the events were absolutely perfect. HAVE FUN! Planning a wedding is literally all “icing on the cake”. As long as you have the essentials – a date and time at the temple – anything else is extra. Also, don’t feel like you have to have everything go by the books. My wedding(s) were very untraditional but that is what makes them so special and wonderful. We had the reception in CO right after the wedding where we danced to “I’m Yours” by Dean Martin for our first dance. We had a reception in Idaho right after our honeymoon and right before we drove out to Ohio in my in-laws’ backyard which was gorgeous. My mother-in-law and sisters-in-law had all the decorations to match our wedding colors and worked so hard to make it beautiful. For the Colorado wedding, I remember that it rained most of the day leading up to the evening wedding. I remember that my mom, the bridesmaids, the wedding planner, and everyone was panicking but I couldn’t have been calmer (which is very uncharacteristic of me). I remember looking out the window of the bride’s room at the venue and seeing Tyson walking with the groomsman and just knowing that it didn’t matter what happened that day as long as we got married. For the temple sealing, I remember sitting in the brides waiting room with my MIL with another girl and her mother. This girl had just been baptized about a year prior by her fiancé and they were both doctors! It was incredible. Tyson and I have such a unique and beautiful love story. It is a love story that incorporates what the gospel can do to change and enhance someone’s life. Because of the gospel and Tyson’s willingness to invite and share, my life is forever better, not only because of learning about the gospel and having those blessings in my life but also by being able to realize and see the hand of God in leading me to a valiant, compassionate, and caring priesthood holder who treats me like a princess every day of my life! There are also many more things that happened in my “finding the gospel” story as well as with Tyson and my dating/getting engaged/getting married/getting sealed that I can add or tell you all about, I just wanted to get some of the major parts in! Thanks for the opportunity to share! Florals | We had our flowers done by Castle Rock Florist – I told them the colors of the wedding and that I would love to have some succulents added in because of our AZ love story and I let them run with that. The flowers were more gorgeous than I ever could have expected. Cake | We had our cake done by the bakery at King Soopers in Castle Rock, CO. I showed them a picture of roughly what I wanted and brought them some edible gold beads to put on it and they created a delicious work of art. They even delivered it to the venue for free! Photography (Colorado) | Our photographer (Jeffery Grounds Photography) made our day one that we will never forget. Before we decided to hire him, he came to my house in CO to talk with my mom and me in person and he answered all of our questions. Once we hired him, he kept in touch with us almost weekly to make sure everything was going well. He even offered advice and help for wedding planning on things completely unrelated to photography. He was incredible and so professional on our wedding day. 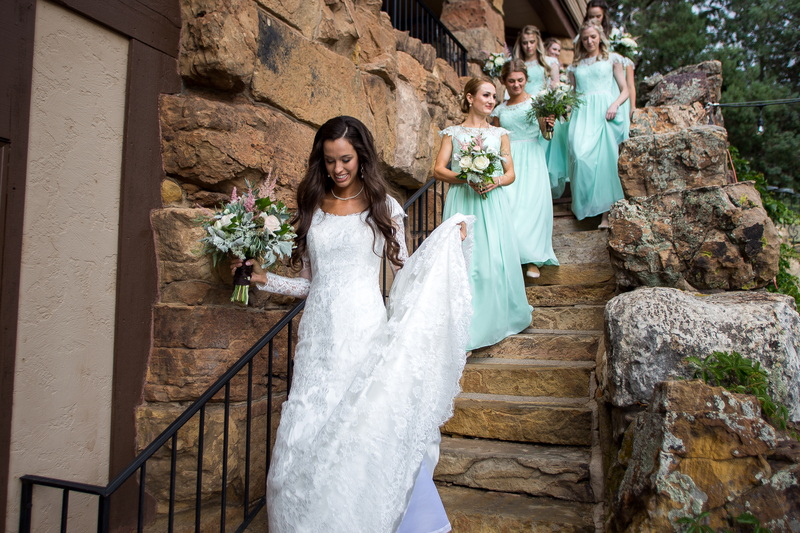 Videography (Colorado) | Our videographers (Complete Weddings and Events) worked as one with Jeff, our photographer. They captured incredible footage of things I didn’t even realize happened on that day!